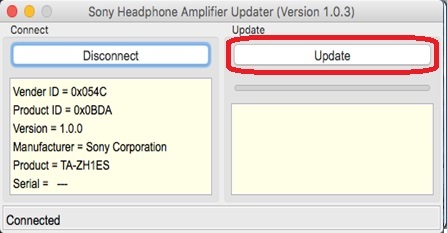 Download the Sony Headphone Amplifier Updater(Mac)_v1.0.3.zip file to a temporary or download directory (please note this directory for reference). Go to the directory where the file was downloaded and verify that the size of the Sony Headphone Amplifier Updater(Mac)_v1.0.3.zip file is 1,121,149 bytes. 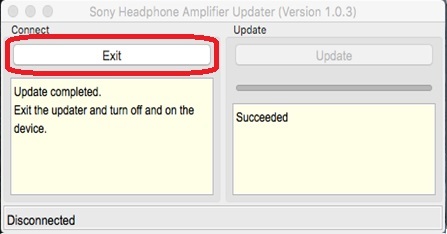 Right-click the Sony Headphone Amplifier Updater(Mac)_v1.0.3.zip file, and click Properties. 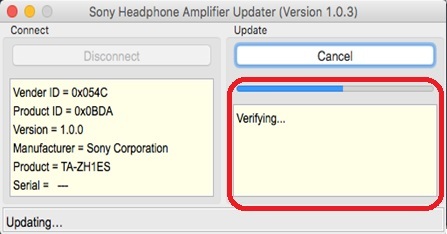 On the Sony Headphone Amplifier Updater(Mac)_v1.0.3.zip Properties screen, verify that the Size: listed is 1.06 MB (1,121,149 bytes). If the file size is different than 1,121,149 bytes, please download the Sony Headphone Amplifier Updater(Mac)_v1.0.3.zip file again. 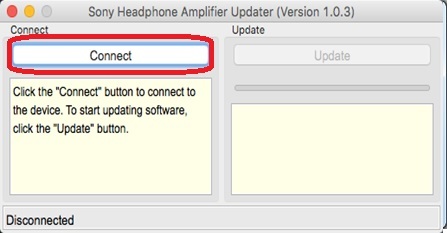 Double-click the Sony Headphone Amplifier Updater(Mac)_v1.0.3.zip file. In the Sony Headphone Amplifier Updater(Mac)_v1.0.3.zip window, double-click the Sony Headphone Amplifier Updater(Mac) file folder. 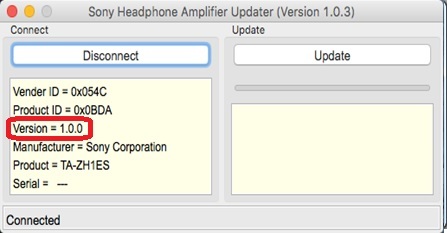 In the Sony Headphone Amplifier Updater(Mac) file folder window, double-click the Sony Headphone Amplifier Updater.app file.